Especially important on Twitter, having a hashtag that only takes up 3 characters is a HUGE bonus. 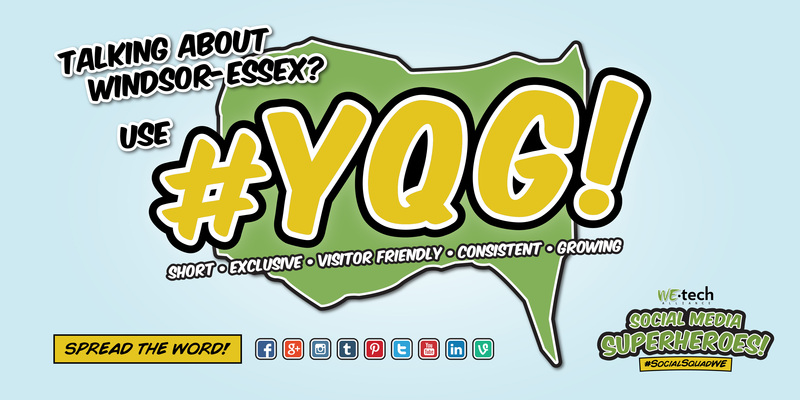 #YQG represents all of Windsor-Essex so no need for multiple hashtags that take up valuable characters. The saying “There’s no such thing as a new idea” has never been more true than with hashtags. Until now. Unlike many other options – #WIN, #Windsor, #Essex, #WE, #WinCity, etc. – that are already in heavy use by countless other regions and topics, #YQG is COMPLETELY exclusive to this region. Your message won’t be lost in the sea of conversations about #Windsor Nova Scotia, #Essex County England, or the numerous other conversations happening all over the world using #WE, #WinCity, #Win, etc. #YQG is used hundreds of times a day, across multiple platforms, and every single instance has been about Windsor-Essex County, Ontario Canada. Try that with ANY other hashtag. Because #YQG is 100% exclusive, it’s a GREAT way of getting your message out to a very targeted audience instead of competing for attention with posts from literally all over the globe in people’s news feeds. Many other cities across North America use their Airport call letters on Social Media, making it very visitor friendly. #YQG is already being used by visitors to this region and is a great way to connect with new people to Windsor-Essex. Having one hashtag for the entire region means that your message will be seen across all of Windsor-Essex County without diluting your reach. #YQG is used in hundreds of social media posts, reaching over half a million unique accounts and nearly 1 million impressions every single day! The posts cover a wide range of events & topics about Windsor, Kingsville, Leamington, Amherstburg, Tecumseh, Essex, Pelee, Lasalle and Lakeshore – a truly regional hashtag! Now it’s your turn. Help spread the word about #YQG!